You might know, if you occasionally read this blog of mine, that I'm doing a research masters in Gender Studies, and my thesis is on trans representation in fiction. You might also know that Sam and I were in London this week, shooting for Superdrug, and we had some time to kill. I'd seen the Museum of Transology exhibition advertised online and thought hey that might be interesting to go and see, but I didn't think we'd be able to - turns out, it was just off Oxford Street at the Fashion Space Gallery, so we popped in for a visit. And honestly - it was incredible. 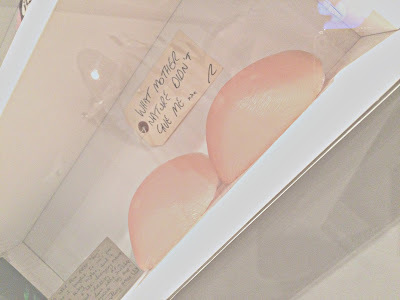 I felt so many emotions as we walked round; I was fascinated by the medical things on display, such as two breasts in jars, one with half a tattoo visible - the other still very much there on a man's body, who's photo was next to the jars - and boxes upon boxes of hormones. But they weren't just boxes of hormones. 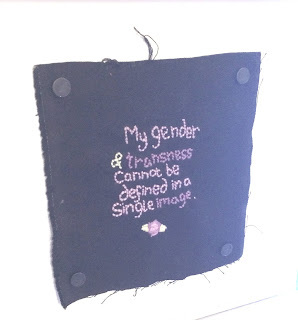 Each one came with a tag (a big theme of the exhibition is tags) and on the tags were stories form trans people: how the hormones had helped, how long it had taken them to get the hormones, and why they had chosen those specific ones. I was touched by the items people had bought to help them transition - people's first lipsticks, and their binders, and the My Little Pony stuffed toy. Some of the stories on the tags were funny, some were heartbreaking, some were educational. There were dresses on the wall and and a homemade packer complete with a she-wee which was apparently not as practical as the creator had thought it would be. I cried a few times, reading people's stories, and it instilled in me this burning desire to make my research mean something. Overall, it was just amazing to visit - we weren't there for long, it's not a big exhibition, but it's important. It was overwhelming and emotional, sad and lovely and happy and funny and angering all at once. Most of all, it just felt right. This sounds amazing! I'm going to try and check it out next time I'm down South!